As a tennis coach, I have learned that video analysis is a great way to break down the performance of each student, as it is easy to miss things while watching live. Unfortunately, it has always been difficult to find the perfect angle of the tennis court. Putting the camera on a traditional tripod does not allow it to capture the entire playing surface. In addition, using a tripod makes it difficult to analyse things like court positioning and shot selections, since the camera is not right on top of the action. It also adds on the risk of players knocking over the tripod or the video camera getting hit by the tennis balls. Luckily, I located the VolleyCam, which has made it much easier to film tennis matches in an efficient and safe manner. The VolleyCam is a camera and mount that hangs on the tennis court fence and oversees the entire court from this position. It simply hooks over the top of the fence. This camera positioning allows you to record the entire playing surface in high definition video, so that you never miss a moment of the action. The positioning of the camera allows you to analyse every portion of your student’s game. If the player is struggling with his or her backhand, you can break it down through the use of this video and determine if the player is using the wrong grip or is guilty of another mechanical error. All of the information that you need to help your students improve will be found by reviewing the videos. You can also use it to film the whole tennis match and analyse the game after that. I used to hold on my mobile phone to film my students' matches but with VolleyCam, this is so much more convenient and easy. The camera mount weighs only two pounds, which is great if you wish to store it in your tennis bag. The mounting hooks are made from steel, so they will not break down over time. Once you have placed the steel hooks over the top of the fence, you can lock the product into place, so it will not move if balls happen to hit the fence where it is sitting. The actual camera is the Kodak high performance camcorder, which will capture the tennis match in 1080p video. This allows it to see everything that occurs during the match, as you can even pick up on close line calls at the other end of the court. It also comes with a wide angle lens which enables you to capture the doubles side lines. This is very important as it allows you to see your movement when you are pulled out of the court. With two hours of recording time, you will be able to record most matches in their entirety. In addition, you can purchase additional memory cards if you wish to record an entire tournament. Ordering the VolleyCam from Amazon was an extremely easy process, as checking out online took a matter of minutes. In addition, the delivery was even faster than I had anticipated, since I have become so accustomed to waiting for products that I order online. Ordering this product was painless, so I was able to help my students improve their games within a matter of days. As a coach, I am looking for every advantage for my tennis players. The more resources that I have at my disposal, the better tennis players they will become in the future. When I film tennis matches, I can pick up on any bad habits that they have fallen into and can even analyse how they play as the match progresses. This tennis filming system is truly one of the best tennis coaching aids that I have found on the market, making it a must for almost every tennis players, coaches or even parents. 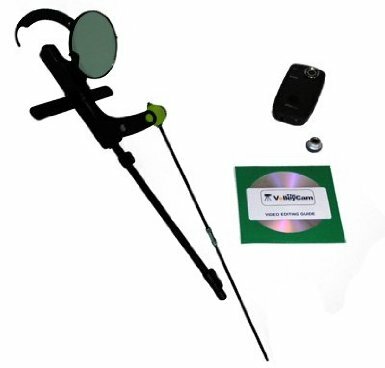 If you are interested in getting the whole VolleyCam system, you can click the link below to order a set from Amazon. I am sure you will benefit from it tremendously. From "Volleycam: Great Product To Help You Improve Your Tennis" To "How To Play Tennis Efficiently And Become A Better Player"